»Culture & Arts»NI: Rainbow Project Abseil – 100ft off Belfast Castle – do you have the nerve? 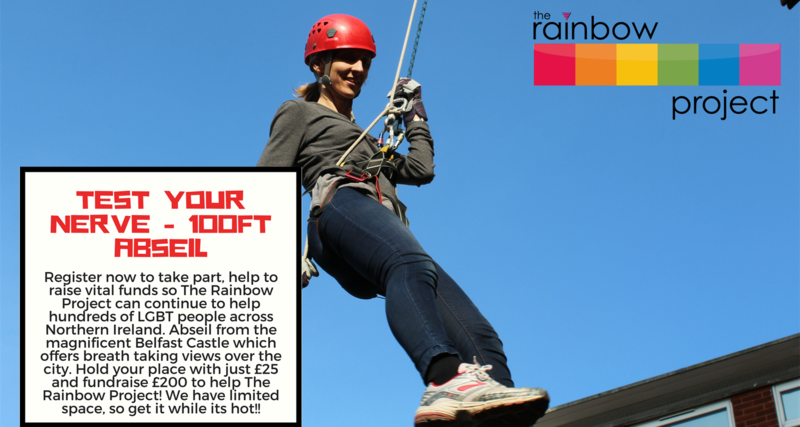 NI: Rainbow Project Abseil – 100ft off Belfast Castle – do you have the nerve? LGBT group for Northern Ireland, The Rainbow Project, Belfast, are holding an abseiling event to fundraise for the centre. They are asking you to commit to raising just £200. Belfast Castle is set on the slopes of Cavehill Country Park, in a prominent position 400 feet above sea level. You will abseil down the 100ft tower, while enjoying the amazing and astounding views over Belfast. You must be over the age of 12 to participate in this event. There really are limited spaces available on this abseil, so register as soon as possible.